At PAX, Volition showed off the current game they are working on. Most people expected it to be a new Saints Row game. They did not expect a standalone DLC. The trailer shows the gang gets together (though not all of the supporting characters are present) for someone’s birthday. While playing Ouija, Matt asks if there will be a special someone for the Boss (your character) only for the board to move on its own and spell out Jezebel. Before you know it your character is sucked into a dimension. As Johnny Gat and Kinzie Kensington discovered, that dimension is Hell. What sticks out for me is that Dane Vogel (former owner of Ultor from Saints Row 2) is Satan’s handy man. Means to me that we might see other characters from the Saints Row series that were killed, but I’m not getting my hopes up. Satan kidnaps you so you can marry her daughter Jezebel, while the gameplay looks chaotic. What has me worried is the customization since your character is kidnapped. Will I be able to customize Johnny or Kinzie in the game, or the weapons? Saints Row: Gat Out of Hell seems very interesting. What appeals to me is the fact that it’s a standalone expansion which means I can have a full “Saints Row experience” (shorter game) without having to play the main Saints Row games, which would require a huge time sink. 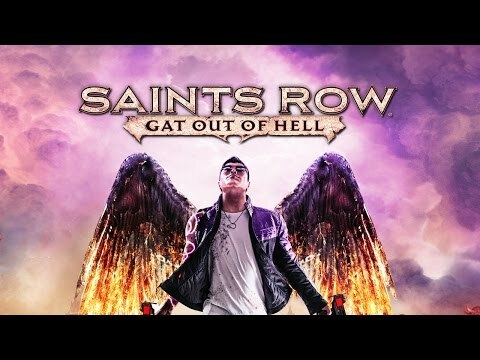 Since I have never completed a main Saints Row game (only dabbled), Gat out of Hell seems like a pretty good option for me. I am also not one to be turned off by the entire Hell setting, and Diablo just happens to be one of my favorite games. And guess what? There seems to be a lot of “Diablos” in there to slay so I’m in!